DSG Gunatilleke also played several voice recordings and cross-examined PTL CEO Kasun Palisena on PTL’s transactions with its related companies (Perpetual Capital Holdings, W.M. & Mendis Co. and Perpetual Asset Management) as well. Earlier, it was explained that theses inter-company transactions had resulted in capital gains transfers to other group companies, which are also owned ultimately by Arjun Aloysius. In two voice recordings it shows that W.M. & Mendis Co’s financial consultant was unaware about some transactions between PTL and W.M. & Mendis Co’, and also the Chief Dealer of PTL, Nuwan Salgado and its back office head, Manjula also had faced difficulties in finding about several inter-company transactions. Mr. Milinda Gunatilleke therefore said that the transactions reflected in the PTL documents provided to the Commission largely represent ‘fictitious deals’ as it only mirrors how the money moved from one pocket of Arjun Aloysius to another. He also said that some of these transactions were also a ‘mystery’ to their own employees as reflected in the voice recordings. When questioned by Justice Prasanna Jayawardena, PTL CEO Palisena said that all of the decisions had come through Arjun Aloysius to engage in transactions with its own group of companies. DSG Gunatilleke then questioned the witness on PTL’s transactions with NSB, SLIC and the EPF, which had been done through an intermediary (DFCC). It was a selling process of Treasury Bonds from PTL to the aforementioned government institution in the secondary market directly and through an intermediary by PTL. DSG Gunatilleke said that all these dealers (in NSB, DFCC, EPF, SLIC) were involved in the process as friends and ‘benefited’ as part of a ring when PTL sold bonds to Government Institutions in the Secondary Market. The DSG was of the view that the whole process was a ‘racket’ which resulted in government institutions suffering huge losses. Earlier it was said that these bonds had been sold to those Government institutions at a lower rate contrary to the prevailing yield rate in the market. However, PTL CEO Palisena disagreed with the DSG’s statement. At this point, the DSG played another voice recording in which Palisena and DFCC’s dealer Kaveen are in conversation. In this conversation, Palisena tells DFCC dealer, Kaveen that PTL’s finance department will call him to know all transactions done through DFCC to NSB by PTL. Palisena at the end of the conversation tells Kaveen: “This is not for them but something for you”. DSG Gunatilleke and Justice Jayawardena explained it was about asking a figure in the transactions to give ‘something’ to the dealer who acted as an intermediary in those transactions. However, Palisena said he asked it with the purpose of evaluating PTL’s transactions through DFCC. 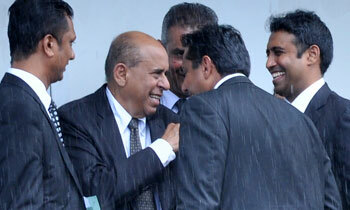 Justice Jayawardena: Why would you be interested in getting DFCC details? Kasun Palisena: To promote transactions through the intermediary (switches) in the future. At this comment by Palisena the Commissioners sarcastically smiled looking at each other. DSG Gunatilleke also submitted the bonus payments and profit benefits paid to Kasun Palisena before the Commission and said they were much higher than the next highest paid in PTL. It was also revealed that NSB dealer, Naveen Anuradha was once an employee of the CBSL EPF department. It was also revealed that DFCC dealer Kaveen was a very good friend of Kasun Palisena. When questioned by Justice Jayawardena it was explained by Palisena that Arjun Aloysius had known all of those dealers very well. Justice Jayawardena: Did Naveen Anuradha work at EPF? J: What about SLIC dealer, Dhanuka? J: Do you know that in 2013, when Perpetual Asset Management was selling bonds to the EPF, Naveen Anuradha was at the EPF as the dealer? J: Arjun Aloysius knows about all of these dealers, right? J: What about other individuals at the CBSL Public Debt Department… would Arjun Aloysius know them as well? J: What about Sarathchandra in the PDD? Would Aloysius know him? W: Yes, and Dhammika Nanayakkara. J: Could you think of high ranked individuals in the PDD whom Aloysius knew well? Witness was thinking again and said that he was not sure about that. Cross examination of PTL CEO Kasun Palisena would continue today. Don't you know? You scratch my back and I will scratch yours!!! The shameless!! The modern face of the greed driven, white colour crooks....... Well done; the camera has captured priceless image! PM and the Arjun mahendran are the master brains behind the curtain.